When it comes to using words that are easy on the ear and hard to forget, Hillary Clinton, in her first at bat of this new campaign season, hit a home run. Her short and sweet announcement that she’s running for President came at the end of a 2-minute video. Clinton scored a 77.2 on the Flesch Readability Scale. If she keeps relying on short words in simple sentences, she should be able to overcome any barbs and bombs hurled her way. 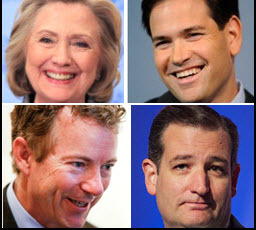 The three Republicans who have said they, too, want to be President paled by comparison, though one showed promise. Sen. Ted Cruz scored 58.5, below the threshold of what makes a good speech. Cruz also used big words almost twice as much as Clinton. Big words don’t work. He’s toast. Rand Paul did much better at 64.1, but was still well under Clinton. Paul did a great job of planting his key message of “We have come to take our country back.” That line offers a readability score of 100 – as good as it gets. Too bad for Paul, though, that the line he chose to stick is divisive. Take it back from whom? Women? Minorities? LGBT? Non-Christians? He’s never going to get beyond his base when he panders to them. Of the three Republicans, Marco Rubio went last and offered a speech that held its own. Rubio scored 60.4. He was the most likely of the Republicans to rely on short words. His Flesch score was slightly above the 60 baseline for a good speech. What set him apart, though, is that he offered a theme could have legs beyond his core of support. His theme to move beyond “yesterday” is the closest thing yet to Obama’s 2008 “change” campaign. It was a master political stroke. Rubio branded his most potent foes – Clinton and Jeb Bush – to being an old generation that are blind to what America and the world is about today. Based on this sliver of a sample, I’d say the Democrat nomination is Clinton’s to lose and the Republican one is Rubio’s to win. Let’s see if I still feel this way in a few months.